ST. LOUIS, Mo. – The city-county merger proposal has been a common topic of conversation across organizations and elected officials. One of the controversies have been whether all Missouri voters should get the choice to join the city of St. Louis and St. Louis County together or if the vote should simply be decided amongst the St. Louis region. However, in order for the St. Louis region to have the ability to address fragmentation, public safety, economic development and other issues residents have brought up and be joined together, an amendment of the Show-Me State’s constitution must be made and voted for by all Missourians. 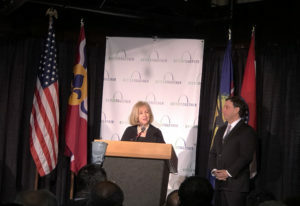 On Monday, the Better Together Task Force, the nonprofit group behind making the merger a statewide vote, was joined by St. Louis City Mayor Lyda Krewson and St. Louis County Executive Steve Stenger to release the governance recommendations report. After five years of gathering research and engaging in public dialogue with residents from across the region at over 30 town hall meetings, the St. Louis City-County Governance Task Force Report can now be shared with the community as a whole. The plan and report from Better Together represents input from over 10,000 residents, community stakeholders, civic leaders and volunteers. The organization’s Task Force group conducted its in-depth studies in six key areas which include Public Finance, Economic Development, Public Health, Public Safety, Parks and Recreation and General Administration. The city and county were first separated in 1876. Since then, there have been nearly five attempts to bring the region back together as a whole. Separated by an arbitrated border, there are 88 municipalities and over 650 elected officials in the region with $2.5 billion being spent each year. According to Better Together, that cost will continue to increase while the population of the region continues to decrease. 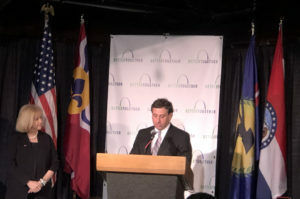 Stenger said the Better Together campaign is an opportunity for the region to build a city that preserves the uniqueness which is cherished by the residents while also “vanquishing the wasteful divisions” that are preventing the region to become the best version possible. In November 2020, voters will be asked to amend the Missouri Constitution by creating a new class of local government which is being referred to as Metropolitan City, or Metro City. This new government will encompass the current geographic boundaries of St. Louis City and County. 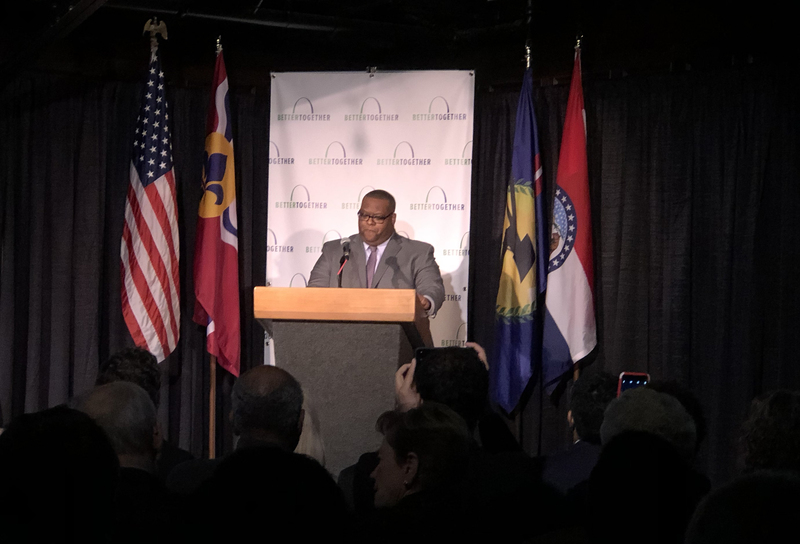 The newly established Metro City will be governed by an elected Metro Mayor and a 33-member Metro Council, representing districts that will be drawn by a nonpartisan expert to the one-person, one-vote standard. In addition, the Metro City will also have only one elected prosecuting attorney and one elected assessor. If the plan does get passed, Stenger will be the first Metro City Mayor, St. Louis County Prosecuting Attorney Wesley Bell will be the city’s prosecuting attorney and St. Louis County Assessor Jake Zimmerman will be the city’s assessor. Metro City will be populated by approximately 1.3 million people ranking 9th or 10th largest city in the United States. The city will be providing one police department and one municipal court under the new unified government while still preserving the identities of the municipalities, its fire departments and its school districts. In Better Together’s report, it established that rather than having 55 local police departments that cover St. Louis City and County, which includes 75 percent that are unaccredited, one professional and accredited police department would provide police services “equitably” throughout the city. The same goes for 81 municipals courts in the combined area of St. Louis City and County to a single court system in Metro City. Through the preservation of municipal districts, each district will have the authority, but not the obligation, to provide their services of fire protection, parks and recreation, trash and recycling, general administrative functions, as well as other services desired by residents but not provided by Metro City’s government. The districts will be funded through local property taxes, utility taxes and fees for service collected with each district. In terms of financial liabilities, all current and outstanding liabilities within the districts will remain where they were incurred, including general obligation debts, special taxing district debts and pension liabilities. If the plan succeeds, debts will be paid utilizing existing revenues collected with a given district, according to Better Together. 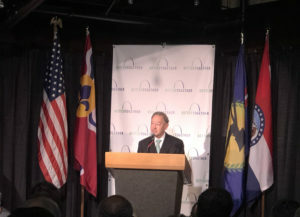 St. Louis City would also remain as a municipal corporation to take care of all current debt and financial obligations. Better Together noted that based on the city’s current debts and earnings of tax revenues, all obligations could be retired within seven years of enactment. A statewide vote to amend the Missouri Constitution is required in order to merge the city and county back together. Addressing the functions that are primarily governed by state law, particularly police and courts, and paring that with the value of maintaining local municipalities as municipal districts in the way that Better Together has researched, require the creation of a new form of local government in the state. The Better Together campaign expects to submit a ballot measure to the Missouri Secretary of State’s Office by the end of this week. The ballot will go through the initiative process of gathering the required, authorized signatures and will recommend that the constitutional amendment be put to a vote in the November 2020 election. When asked why this merger and proposal is being done now, Mayor Krewson noted that 2020 is the upcoming presidential election and when there will be the most voters to get this proposal adopted. Amending the constitution through a statewide vote will allow the region the opportunity to make decisions to have a better, more equitable metropolitan city for the state. If the plan presented by Better Together is adopted during the November 2020 election, a two-year transition period will go into effect on January 1, 2021. Watch the Together STL Live Stream here.